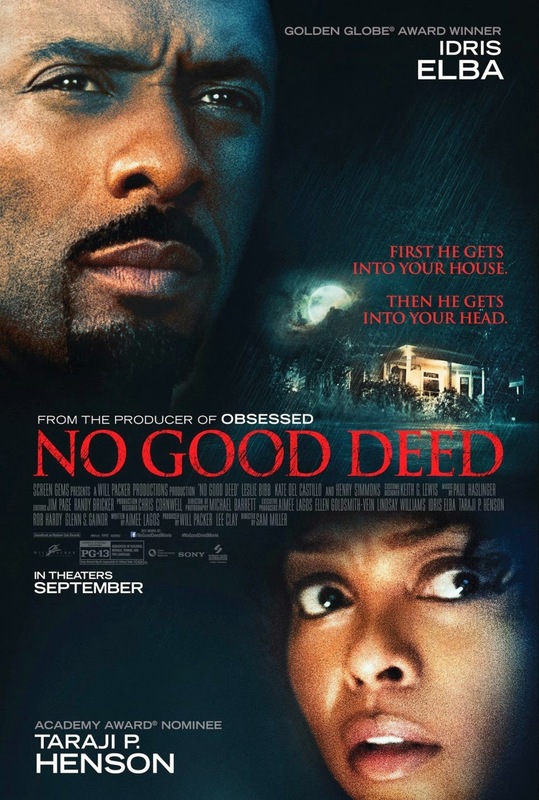 No Good Deed (2014) is an American Thriller movie starring Idris Elba & Taraji P. Henson and is directed by Sam Miller who also directed some episodes of Luther (TV series). The movie has really all the ingredients of being a thriller with it's story line and music/sound effects. I really loved watching this movie as story unfolds scene by scene. This is one of those movies which you need to go to multiplex to watch it on big screen with surround sound system. No Good Deed (2014) also stars Leslie Bibb, Kate del Castillo, Henry Simmons and Mark Smith. Idris and Taraji are the main characters as they take your breath away with their acting skills. It was so great to see Taraji after Think Like a Man too (2014) in a different avatar. The movie is the story about a criminal as he enters the house of a lady whose husband has went on a trip to his father's house. How their paths meets and what happens aafterward is the main context of this movie. The movie will definitely send chills down your spine. I loved every scene of the movie after The Equalizer (2014). Idris eyes speaks much more than his words and really brings that criminal look that scares the hell out of you. Taraji has acted well with all her charm and really fights her way back to save her kids and family. The movie is about not losing hope and courage when faced with adversity.It's only during bad times when your character is tested. Movie got released in Ster Kinekor on 21st Nov 2014. More info on twitter and facebook. Check out this movie on big screens before it's taken out.